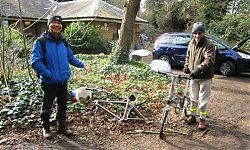 On a bright Saturday morning in February a group of TDP enthusiasts plus some new faces joined Laurie Elvin at the Coach and Horses at the western end of Brentford High Street for a convivial coffee before setting out for a trek across Syon Park. On entering at the Duchess gate, where Laurie pointed out the repairs made to the gate in coadestone, we stopped just inside the park wall at the site of the 2012 Birkbeck training dig, when an excavation was carried out on the site of the 16th century Little Syon House, at one time occupied by Sir Francis Darcy and later by Sir Richard Wynne. Laurie showed us copies of the only known images of the house and told us something of its history such as its involvement in the Civil War, and what had been found last year – as he said, not a lot. Towards the end of the dig a brick staircase had been found leading down to a cellar, which had probably been situated in the eastern wing of the house. The cellar had been filled in but this was emptied out down to its floor level. 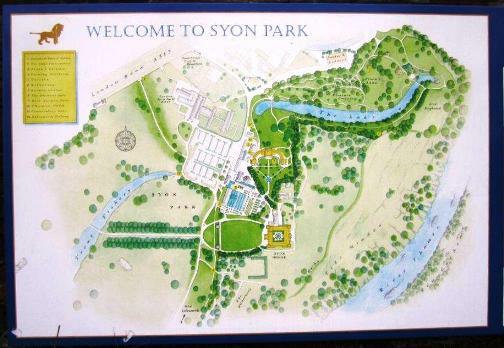 Although the site was complicated by having been used as a dump by the Syon estate, Roman material had also been found. As we walked on the land noticeably sloped down towards the Thames in the distance. 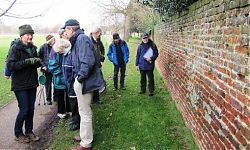 Laurie told us that a palaeochannel had been found between the modern road and Syon House, part of which is now marked by the position of the fishing lake which was part of the design of the grounds as devised by Capability Brown. This had been the course of the Thames some 50,000 years ago, but the river had later cut itself a new route slightly to the south. The old channel had been recut perhaps in Saxon times and so the resulting island of slightly higher land had been a good site on which to place the Bridgetine Abbey in the early 1400s. 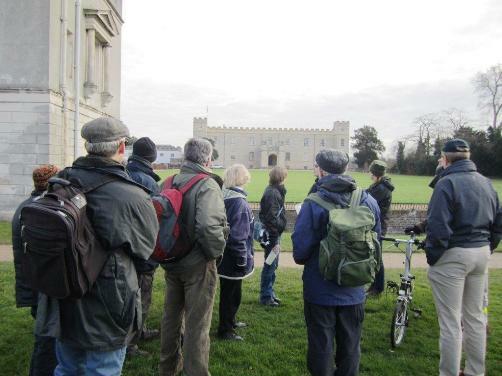 We walked on to Syon House itself and Laurie told us of the end of the Abbey in 1539 at the Dissolution, the building of Syon House by Protector Somerset, and what had been found first by Time Team in 2003 and subsequent Birkbeck training digs between 2004 and 2010. Historical events recorded at the abbey such as the sojourn there of Katherine Howard before her execution suggest it was finally demolished by Somerset as late as 1547. More recent geophys work on the front lawn of the house, together with old illustrations, showed evidence of buildings running out from the corners of the house towards the “Pepper pots” on either side of the main gate. This had been investigated in 2011 and some walls found. 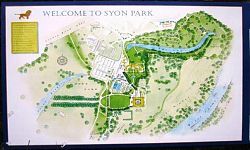 Syon House may well have originally been built around a series of courtyards like Hampton Court. 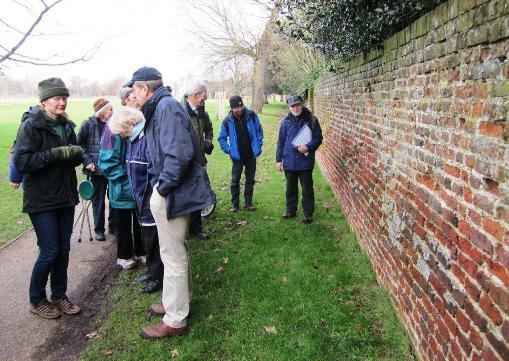 Walking on we examined the wall which runs parallel with the driveway leading towards All Saints, Isleworth, and considered whether the narrowness of the red bricks in the lower part suggested they might be Tudor in date. Entering a gate in this wall, we stood before an inner gate and contemplated the water meadow, with a glimpse of the Thames on the other side. 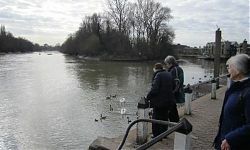 The meadow was very “soggy” and uninviting, and Laurie described the hazards of crossing it to work on the foreshore at Syon Reach. We learned of some of the work there by such luminaries as Sir Mortimer Wheeler and Ivor Noel Hume – especially their finding of brushwood interpreted as prehistoric hut floors, which they in turn interpreted as indicating lower tides in that era – and more recently of the TDP in recording timber posts there, work which needs to be completed. Laurie pointed out that more research could be done on such subjects as fishing, types of boats using the Thames, local boathouses, etc. One of the party mentioned having seen records of tides in the 1500s in an archive at Cambridge. 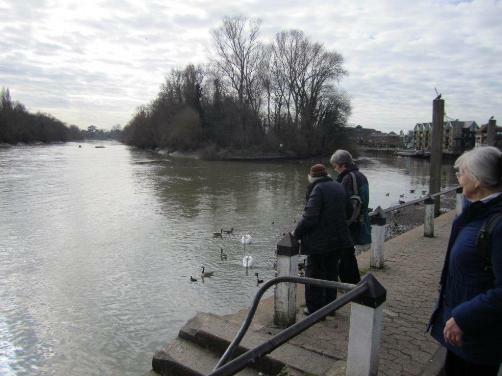 We then moved on to Isleworth riverside and looked at the slipway leading down from the London Apprentice pub. Laurie had brought along a plot of work already achieved there, but this too is still to be completed. Some tapes were produced and an attempt made to establish where the measurements in the plot were taken from. 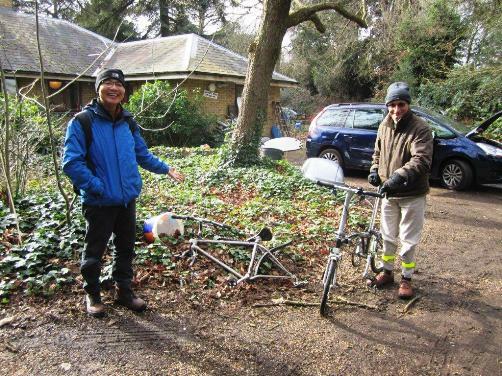 With several of the group expressing interest in coming along to complete some of this work at Syon and Isleworth, we departed. 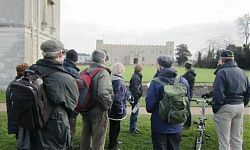 Thanks go to Laurie Elvin for conducting a well-prepared and interesting walk.